The Pattern Day Trader Rule (PDT Rule) is one of the most common grievances amongst new traders. This FINRA rule states that traders with less than $25,000 in their accounts are limited to three day trades (known as “round trips”) in a five day rolling period. Failure to adhere to this rule will result in a 90-day lock on a trader’s account, during which a trader’s funds will be frozen. This rule was designed to prevent less-sophisticated traders from “gambling” in the markets, and although FINRA would claim this rule is a protective measure, many new traders adamantly disagree. For our purposes, we’re not going to debate the merit of the PDT Rule. It’s a reality of trading that you’re better off accepting. Today, we’re going to put this rule into perspective and discuss a few tips & tricks. Before we get to some actionable insights, let’s put things in perspective. Let’s assume you are trading profitably with a $5,000 account and going “all in” on every trade. If you average a 5% win, you can make $250 per trade. With three weekly trades, this would equate to a monthly return of 60%. Within five months (accounting for compounding), you would bypass the PDT rule. 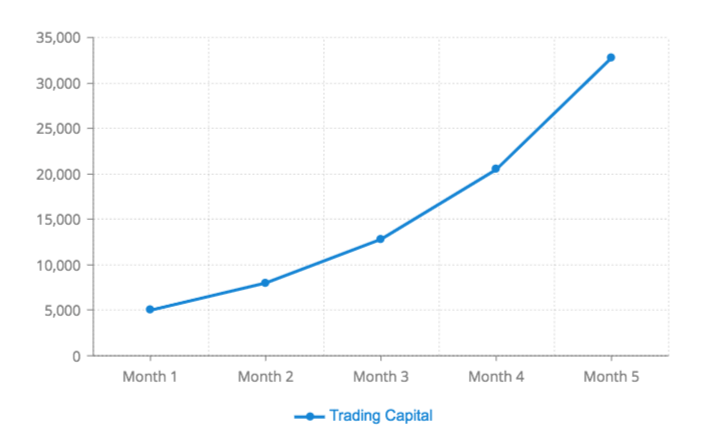 During the preceding period, you would develop discipline and patience, and these five months of “limited” profits would be a speck in your fruitful trading career. Let’s assume you are losing money in a $5,000 account and going “all in” on every trade. If you average a 2% loss, you lose $100 on every trade. 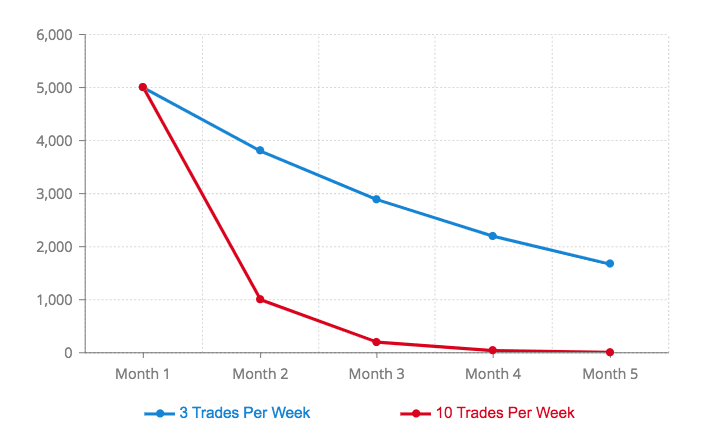 With three weekly trades, this equates to a 24% loss every month. In this case, it makes little sense to place more trades, as every trade you place is draining your capital. In this case, the PDT rule is actually protecting you from yourself. The rule is helping you limit your losses at a time when you are still learning. With this perspective, the PDT rule is a temporary roadblock for profitable traders and a beneficial restriction for unprofitable traders. Here are some tips both groups can use to navigate the PDT rule. There's so much misinformation surrounding the PDT rule. Some people avoid trading altogether because they assume you need over $25,000 to be a trader while others only discover the rule after they get their accounts locked. If you're reading this post at the beginning of your trading career, you have an advantage. The first step towards trading under the PDT rule is accounting for its existence. You need to recognize this constraint before entering the trading arena. It's just another rule of the game. Keep this in mind during your paper trading phase (the phase at which you trade in a "virtual" account) as this is where many traders get in trouble. 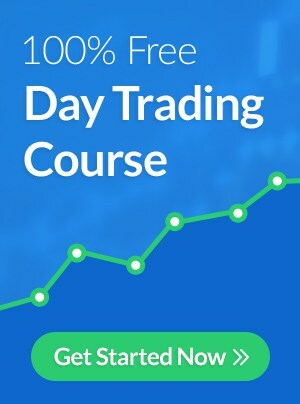 They start with a $100,000 virtual portfolio, place dozens of trades per day, and overvalue their "virtual" success. When it comes time to trade with real money, that $5,000 account just can't seem to match the performance of the $100k virtual account. This doesn't even speak to the differences between trading with real and virtual currency (as discussed here). It relates to strategy. This trader spent his learning period trading like a hotshot and lost touch with reality. Instead, this trader should have focused on developing a feasible strategy would carry over to trading with real capital. Of course, this doesn't mean you need to paper trade under the PDT rule; it would be foolish to limit your education. Just keep this rule in mind so you can develop a practical strategy. 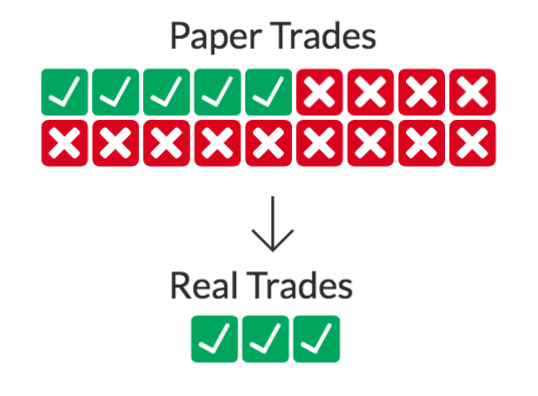 Use paper trading to discover your strengths and weaknesses before you put real money on the line. Once you identify some of your strengths, you can begin testing them at a small scale with real capital. The PDT rule may even work in your favor, which leads us to the next point. Most traders would benefit from valuing the quality of their trades over the quantity. New traders should be even more selective as they are dealing with lower average win rates. If the odds are against you in every trade, it’s not in your best interest to compound these probabilities. The PDT rule forces you to be selective with your trades. When trading under this rule, it’s your responsibility to choose your three best trades every week. Imagine if you had to do this in other areas of your life, such as limiting your TV-time to three hours per week, limiting your gym sessions to 15 minutes, or your email/phone time to 10 minutes per day. These restrictions, while seemingly obstructive, actually promote efficiency. If you know you only have 10 minutes to accomplish something that usually takes 30, you’re likely to increase productivity. Similarly, if you need to achieve results from three trades every week, you’re likely to increase the quality of each trade. This is a great habit to adopt at the beginning of your trading career as it will enforce the principles of patiences and selectiveness. The PDT Rule can also take some of the pressure off of new traders. You don’t need to master trading overnight. You just need to place three good trades every week. Tip #3 is a quick one. It’s a reminder that the PDT rule restricts round trip trades. A round trip is where you buy and sell in the same day. Under this rule, you can still have multiple entries with one exit or multiple exits from one entry. For example, you could buy three lots of 200 shares, and sell 600 shares to exit the trade or vice versa. This can be effective for traders who feel pressured to go “all in” in fear of wasting a day trade. Important Note: Different brokers may have different definitions of "round trips." Make sure to check with your broker before utilizing this strategy. Some brokers allow one entry with multiple exits while others allow multiple entries with one exit. If you’re trading with less than $25,000, it’s likely you have other responsibilities during market hours (i.e. school or work). If this is the case, day trading may not be your best option. Placing intraday trades on the job can be stressful especially when dealing with highly volatile stocks. Part-time traders may have better luck with swing trading (i.e. buying and selling over a few days or weeks). Swing trades do not count towards round trips under the PDT Rule, meaning traders can take advantage of short-term price action without limitations. Another benefit of swing trading is that the percentage returns can be higher, which is great for smaller accounts. The list of stocks that make 10% moves over a 1-week timeframe is much longer than the list of stocks that make similar moves intraday. In the first three tips, we discussed how traders can use the PDT Rule in their favor. If you’re dead set on bypassing the rule, there are a few options. Note, that these methods are not recommended in most cases and the three tips above will be far more effective over the long run. The PDT rule applies to margin accounts, but not to cash accounts. The benefit of margin accounts is that they allow you to “borrow” money, whereas cash accounts are similar to bank accounts. The last two uses are the most important, as new traders shouldn’t be using leverage anyway. If you use a cash account, you will not be able to short stocks or trade with unsettled funds, which could be a dealbreaker. Even if you have no interest in short selling, waiting for funds to settle could have the same impact as trading under the PDT Rule. For example, if you buy a stock for $5,000 and sell it for $5,100, the proceeds need to settle for two days before you can trade with that $5,100 again. If that $5,100 represents all of your capital, you won’t be able to trade at all during the settlement period of two days. Failure to adhere to this rule will result in a 90-day lock on your account. Note: You can BUY stocks with unsettled funds, but you cannot SELL those shares until the funds are settled. 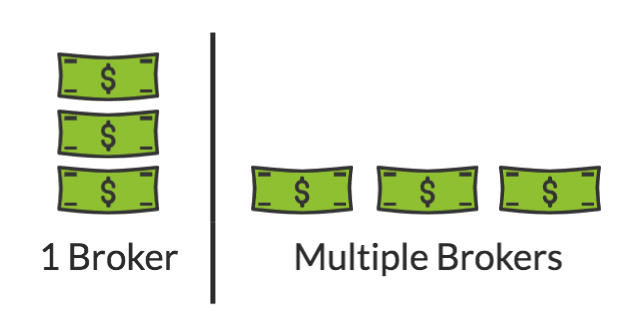 New traders can split their capital across multiple brokerage accounts. For example, you could have $2,000 at Ameritrade, $2,000 at ETRADE and $2,000 at Schwab. Each account would grant you an additional three round trip trades, as they would be independently subjected to the PDT rule. You limit your buying power in each account (i.e. you have buying power of $2k in three accounts vs. $6k in one account). Some brokers have been able to circumvent the PDT Rule by establishing themselves offshore. Since these companies are not US-based, they are not required to adhere to the PDT rule. Make sure to do your research as some of these firms charge exorbitant fees and/or may be sketchy. As a trader under the PDT rule, you have the option to accept it or circumvent it. In 99% of cases, accepting the rule is your best bet. Almost every successful trader started out with a smaller account and earned his/her stripes. Be patient and work on refining your craft. As much as traders like to find scapegoats for their underperformance, the PDT Rule will NOT make or break your success as a trader. If you’re fortunate enough to find yourself in the minority of traders who make a living from the markets, you the PDT rule is nothing more than a temporary hindrance. Accept it and focus on what’s important - your trading performance. Thanks I'm new at this and you explained the rules very clearly. Is Suretrader ok to use? I know you have suggested them in the past. Multiple entries, one exit equals one trade. I can do that! !Was that so hard to say? Nobody has ever said those words, ever on the internet. "Multiple entries, one exit equals one trade". Go ahead google it. @call it’s different for every broker. For example E*TRADE each buy counts as day trade. So you buy 600 shares/ sell 200 three times its one day trade, where buy 200 shares 3 times and then selling 600 once equals 3 day trades. Trade zero it’s different as well. I see a lot of people open a brokerage account and never actually spend 5 mins with them to find out how it’s working with them. This post is the most instructive in regards of the pdt rule i have read so far i was searching for this type of information for a long time and finally came to me thank you very much nate and all IU team. Thank you Nate. You make for explaining the PDT rule. I got restricted from the day trading twice because of my lack of discipline. I learned from from and I start to track every day trade now. I'm really enjoying reading your articles. I see them as instructed and informative. As a one that consider himself in the beginning of his career, those articles as really important and insightful. Thanks you for putting the time and energy. Great advice. Thank you very much Nate. Clarity is important in this business and your lessons bring just that. Ironically i just found out this info yesterday, so clarifying it made things much more sensible and gave me a direstion to go wiith. Ive learned a geeat deal from u guys already and it just keeps gettn better. Thanx guys, keep it up, the little.guy needs u!!! One thing that is probably obvious to some, but not others (me) is that its over a 5 day TRADING period. 5 business days. Holidays and weekends do not apply. If you make 3 day trades on Wednesday you cannot make anymore until the next Wednesday(assuming no holidays). 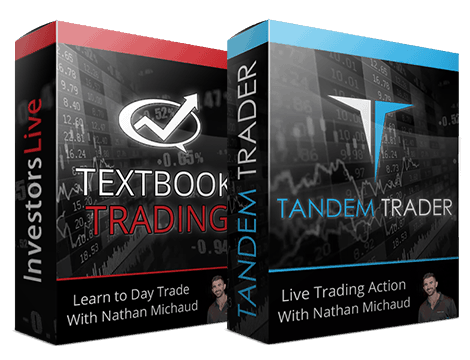 If you did 1 day trade Wednesday and another 2 on Thursday then next Wednesday you'd only have 1 available trade. You would get the other 2 trades the next day. Something that messed me up in the beginning.